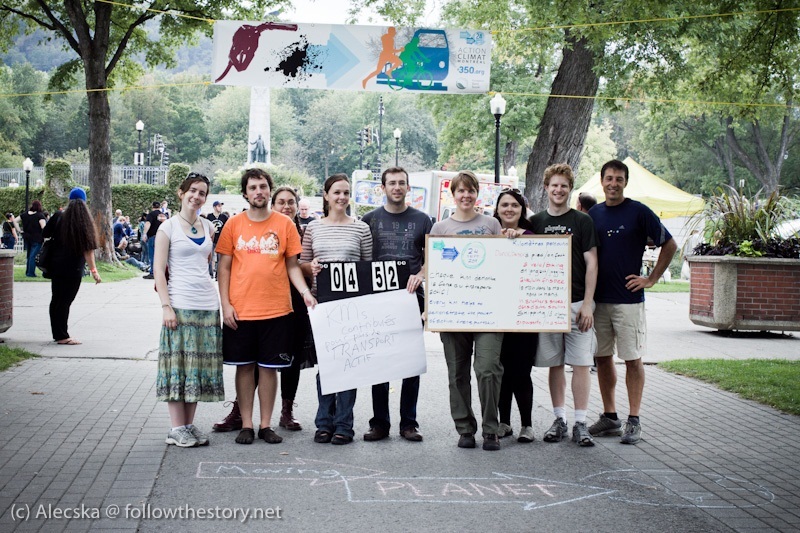 Moving Planet was a worldwide event that took place on September 24th, 2011. It was conceived by the folks over at 350.org as an effort to help the world transition away from fossil fuels. 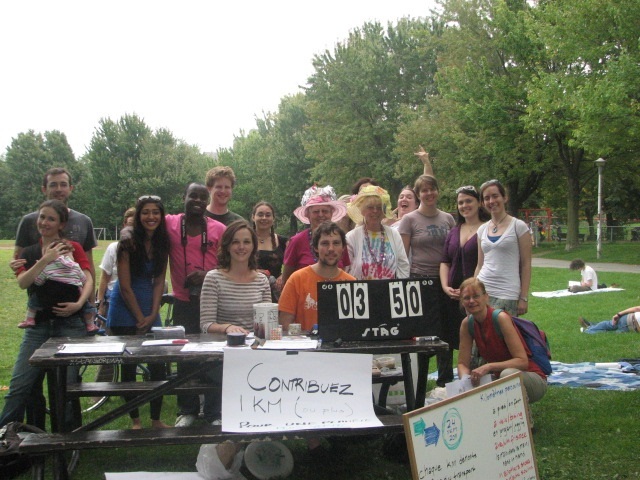 The Moving Planet event in Montreal (which took place in Parc Jeanne-Mance) was planned by local volunteers. All we got from 350.org was the name and the logos. We did get some very significant help from the David Suzuki Foundation (Montreal chapter) with regards to planning and execution of the event as well as media releases. The event included what we called a ‘kilometer drive’ in which people could contribute their green-transport kilometers to a collective total. A green kilometer would be one achieved on foot, bike, skateboard, roller blades, unicycle, etc. The goal of the kilometer drive was to demonstrate the power of active transportation. Carrying a toddler in ‘airplane’ position the whole way. I think it is sufficient to say that we had a great time with the kilometer drive. Next year we think it would be an excellent idea to get active transport groups involved in the planning and execution of the event. Montreal definitely has communities of cyclists, skateboarders, joggers, rollerbladers, etc. We think it is reasonable that some of these groups might be interested in showing off the capabilities (and fun) of their chosen mode of transport. I like to think of the kilometer drive as a celebration of the tremendous human capability to achieve active transportation. By doing so, we are improving the long-term health of both our environment and ourselves. A transition towards less energy-intensive transportation is a must in the decades to come. It seems extremely unlikely that we as a society will be able to continue to spend such incredible amounts of energy on our personal transportation systems. This seems likely to be true even if we do not factor in the broad and substantial costs of continued fossil fuel usage by our societies. Lastly, a couple weeks before the event, CKUT Radio interviewed me about Moving Planet Montreal and Vision of Earth. The less waste the less crap sitting in land fills waiting to rot away. Some of the waste creeps down into the water table which is a very bad thing. Waste is bad. Keep in green.